Last week’s contest was won by Poster Child. It was in Dash Point, just north of Tacoma. 2) Gabrielle Giffords will resign from Congress after the SOU speech. Okay, the trick to this week’s contest is, either this isn’t as easy as it looks, or it is as easy as it looks — the question is which? The Costa Concordia’s port of registry is Genoa, Italy so my first guess would be this is her berth in Genoa, Italy but I have a sneaking suspicion that’s wrong. The key clue is the identity of the other ship, which is only partially revealed by the photo. So, kiddies, start digging for cruise ships that match the big guy in the foreground. This could be a port of call, you know, just about anywhere. Another clue is all the vehicles in the photo look exactly the same. And the vegetation is palm-tree-ish in a southern Mediterranean sort of way, so I don’t think we’re talking Norway here. RR is right on. It’s where both the Costa Line and the Tirrenia ferry line both dock. I’ve looked in Genoa, and the planned termini of the Costa Concordia’s last voyage, Civitavecchia and Savona. 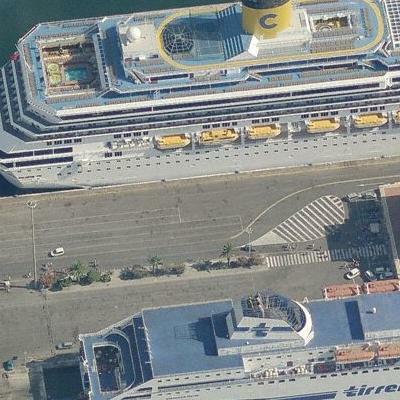 In fact, that bird’s eye, if you rotate to view south, is of the Costa Concordia – nice get, Lee. Oops – I guess you don’t have to rotate it to see the name on the side. Still, nice that you caught the ship in happier days. Good win! I started looking at Italian ports thinking I’d find something worthwhile. Palermo was the third one I checked out and boom! The ship was right there. Had to do it. Looks like Savona, since it has the split pier, but where I last saw Concordia I was in Civitavecchia, which is one long harbor. This whole mess may have created a buying opportunity in Carnival’s stock, which has slipped a bit since this happened. People aren’t using their noggins; Carnival’s insurers, not Carnival, will take the financial hit. RR @ #10: Carnival’s insurers will indeed take most of the hit, but the bad P.R. may be devestating to Carnival in particular, and the entire cruise industry, at least in the short term (a year or so). Investors might be looking at who’s paying the bills, but the bigger issue may be whether elderly people and honeymooners feel safe taking a cruise ship. This disaster made any feelings about the professionalism of the captains seem like a joke. On the radio coming in this morning, some folks were predicting that the entire cruise industry will probably cut back on advertising for a couple of weeks (Carnival will have pulled virtually all advertising), right when they usually book a lot of cruises. After that, there will be lots of fare sales and promotions to bring people back.